Will Terror Threaten India's Economy? 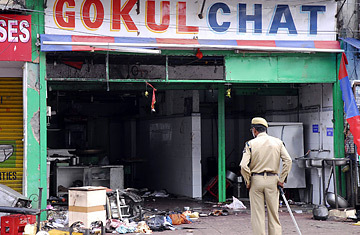 A policeman looks at a damaged restaurant, one of the sites of Saturday's bomb blast in Hyderabad, India, Sunday, August 26, 2007. Since Microsoft became the first big foreign company to set up shop in Hyderabad in 1998, the southern Indian city has emerged as an IT hub to rival the outsourcing mecca of Bangalore. Home to more than 200 IT multinationals today, its success has earned it the nickname 'Cyberabad.' But it has earned the attention of terrorists as well. On Saturday, Hyderabad was targeted for the second time in four months as two bombs filled with metal pellets detonated in crowded areas of the city, leaving at least 42 people dead and more than 60 wounded. Subsequent searches revealed as many as 19 more explosive devices strewn across the city. Authorities blamed "external agencies" for the attacks, particularly Islamic militant groups such as the Bangladesh-based Harkat ul-Jehadi Islami and the Pakistan-based Jaish-e-Mohammad and Lashkar-e-Toiba. "We are not cowed down," Home Minister Shivraj Patil said at a press conference after visiting the bombing sites, vowing to take steps to eliminate terrorism. That may be a tall order, given that terror attacks are becoming more and more audacious. The key economic hubs of Mumbai, Bangalore and Coimbatore have all been attacked in recent years, resulting in the deaths of hundreds of people. Since 2004, The Times of India reported Monday, India has lost more lives to terrorism than any country other than Iraq. Cross-border terrorism  blamed for most of India's recent attacks  is not the only threat to India's internal security. It also faces an armed Maoist insurgency that afflicts vast swaths of territory across 16 of its 28 states, and that Prime Minister Manmohan Singh called the country�s "single biggest challenge to internal security." In addition, several militant and insurgent outfits are active in the country's northeast. Meanwhile, the disputed territory of Kashmir remains a tinderbox of conflict six decades after independence. But India's grim security situation hasn't hindered its growth. Since 2004  the same period considered in The Times of India's terror report  India's economy has grown by more than 8% a year, among the fastest rates in the world. The country's benchmark Sensex stock index actually rose in the days following the blasts, its growth unchecked by the disaster. "The fundamentals of the economy are strong, and there is a high degree of resilience," says Viren Mehta, Mumbai-based partner at the financial services arm of accounting giant Ernst & Young. In fact, the high-risk, high-return nature of India's economy is part of the reason many foreign investors are here in the first place. "Investors have come in and stayed after factoring in the security problem," says Soumitra Choudhury, economic advisor at ICRA, an associate of Moody's Investors Service. "I don't think small-scale attacks will affect growth in the long run." Security experts do not share this optimism. Ajai Sahni, executive director of the Institute for Conflict Management, points out that India has invested dangerously little in its internal security apparatus. "India is one of the most under-policed states in the world," he says, "the U.N. norm is for 222 police personnel for every 100,000 people. In India, it is 122 for 100,000. Moreover, rural policing has almost collapsed, so that those targeting cities are able to use rural bases without fear." Terrorists, meanwhile, have stayed ahead of the law enforcement agencies, adopting ever more sophisticated methods and equipment. The Hyderabad bombers apparently used Neogel-90, a high-intensity commercial explosive, which needs a high degree of skill to handle and has not been used in terror attacks in India before. Most recent attacks have been the joint handiwork of several terror outfits, with a complex and highly staggered chain of command, which makes detection difficult. The security situation might well prevent the benefits of India's economic boom from reaching its less developed parts. Retired Brigadier B.K. Ponwar, who heads the Counter-Insurgency and Jungle Warfare College in the eastern state of Chhattisgarh, points out that vast areas of the country are unable to attract investment due to various security threats. "Chhattisgarh has a wealth of mineral resources, but who wants to go there?" he asks. "The tea and oil industries in the northeast are barely limping along." Even in its wealthiest cities, India's poor can still bear the cost of its security lapses. "It is usually the poor who get killed in terrorist incidents, and the value of their lives is marginal," says Sahni. "That is why there is no effect on politics, economy or governance."